The promos are for the week of January 5th through January 11th, 1974. (Thank you ever so much, My Monster Memories.) ABC’s The 4:30 Movie (the 3:30 movie in Los Angeles) was hugely influential, along with horror showcases like Chiller Thriller and Creature Double Feature, in the horror and monster renaissance of the 1970s, and a major reason American kids became obsessed with Godzilla (and kaiju) in particular. 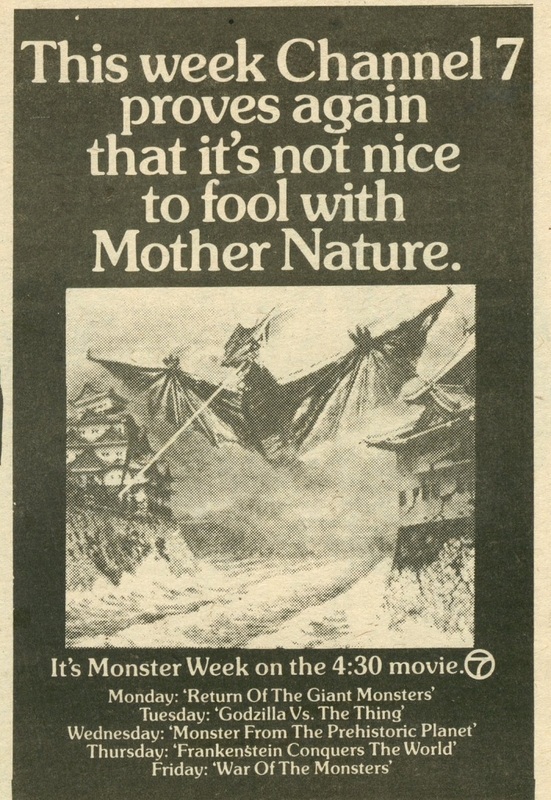 Return of the Giant Monsters is the American release of Gamera vs. Gaos (1967); Godzilla vs. the Thing is Mothra vs. Godzilla (1964); Monster from the Prehistoric Planet is Gappa, The Colossal Beast (1967); Frankenstein Conquers the World is Frankenstein vs. Baragon (1965); and War of the Monsters is Gamera vs. Barugon (1966). All of the films were released in the U.S. by American International Pictures. The 4:30 Movie featured several recurring themes over the course of its long run (1968 – 1981), including Superhero Week and Planet of the Apes Week. You can see a whole bunch of the promos, and read more about the history of the show, at DVD Drive-In. I’m hosting my very own monster week here, focusing on Godzilla and friends, and it’s leading up to something really cool on Thursday. I loved watching these movies on the channels we could get from California stations when I was a kid in the 70’s. Thanks for another great trip to my well mis-spent youth! Man, I loved the 3:30 movie on channel 7! I saw many of the movies that warped…er, shaped me into the person I am today (Trilogy of Terror at 3:30p is no less terrifying as a kid than it would’ve been at night).